Tomorrow’s leaders cut their entrepreneurial teeth at the Technikon Witwatersrand (TWR). The institution has long been recognised as a higher education leader, not only in the business-related market, but also in engineering, health, design and mining. For five years running, TWR won a Professional Management Review Golden Award for being the best Technikon in South Africa. The high marketability of TWR graduates and an uncompromising commitment to excellent career-orientated education made it the natural winner of this prestigious award. The TWR has conferred degrees since 1996. To date, 3 391 students have received degrees. The Technikon’s strong emphasis on technology provides South Africa with graduates who are able to understand, appropriately develop and use the myriad technologies which are characteristic of almost every facet of modern businesses, from graphic design to medicine. TWR has almost 400 academic staff members who are located in four faculties. The Technikon Witwatersrand (TWR) was founded in 1903 as the Transvaal Technical Institute, established initially to serve the mining industry. More than three-quarters of a century later, the TWR continues offering its students and the communities it serves quality career higher education. Currently, TWR has some 14 500 registered students. 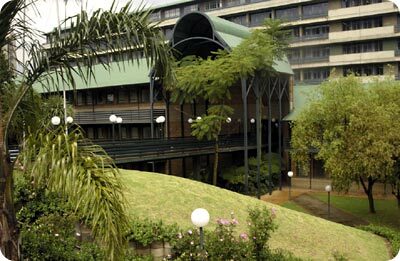 There are four campuses located in and around Johannesburg – the Doornfontein, Auckland Park, Eloff Street and Smit Street campuses. Building has started on new state-of-the-art buildings in Auckland Park to house the Faculty of Art, Design and Architecture and the School of Tourism and Hospitality from 2005 onwards. This will be a one of its kind centre, designed to train top-notch graduates for the hospitality, tourism and art industries. The TWR maintains close and dynamic links with industry, business and the public sector, enabling it to review and alter programmes as circumstances change in the marketplace. Students therefore graduate with appropriate and applicable skills and knowledge. Jobs of the future will increasingly be provided by small business and decreasingly by big business and the public sector. The TWR places much emphasis on developing entrepreneurial skills to equip students to deal with this reality and to make them eventual providers, not mere seekers of jobs. To be considered for entrance, students must be in possession of a matriculation certificate or equivalent school-leaving certificate. In some instances additional entrance requirements are needed. Most applicants are required to pass a selection test which examines aptitude and ability. Qualifications include: the National Certificate, National Higher Certificate, National Diploma, National Higher Diploma and Bachelor, Master and Doctor of Technology degrees. The National Diploma remains the TWR’s main qualification. However, a B Tech degree is the professionally recognised exit point for most programmes. In the majority of programmes, students first complete a National Diploma and then proceed to degree studies. In the majority of programmes, students first complete a national diploma and then proceed to degree studies. TWR boasts three well-resourced libraries. Full-time nursing sisters, qualified to deal with a wide range of minor medical problems, are available at both the Doornfontein and Auckland Park campuses. The TWR Health Centre is situated on the Doornfontein Campus and offers professional services ranging from chiropractic consultations to optometric assessments at medical aid rates, where applicable. The Academic Support Unit (ASU), in conjunction with the Faculties, runs a number of access and support programmes for prospective students. If you do not meet the specified admission requirements, you may still qualify for one of the access programmes. Successful completion of the access programme guarantees your acceptance into the Faculty. The TWR boasts three libraries stocking a wealth of literature to assist you in your studies, as well as audio-visual facilities for students who wish to use videos, CDs and audio tapes for study and research. The TWR is home to some of South Africa's most promising young sportsmen and women. We offer a wide range of sports including aerobics, boxing, soccer, rugby, golf, martial arts, volleyball, softball and chess, to name a few. Sports bursaries are available for students who have achieved at least provincial colours in their chosen sport. The Student Affairs Department offers such a variety of activities that, whatever your taste or lifestyle, you're certain to find something you'll enjoy. Some of these include lunch-hour concerts, film shows, singing, dancing, drama and debating societies. TWR maintains two state-of-the-art Internet Café Style Cyber Centres, on the Doornfontein and Auckland Park campuses, giving TWR students access to information technology, the worldwide web, e-mail and educational software. Our Co-operative Education and Placement Unit (CPU) assists both its students and industry to find experiential learning placements and full-time employment. The TWR’s nine residences accommodate 2 000 students. Each residence has television lounges, games rooms, parking and laundry facilities and either catered or self-catering accommodation.